Learn about the different ways UC San Diego explores, supports, and celebrates the many cultures that make up our diverse community. The Black Resource Center is a Campus Community Center which serves the entire population of UC San Diego while emphasizing the Black experience. Celebrate with us as we promote scholarship, foster leadership, and cultivate community. The Center for Ethics and Spirituality is an inclusive community at UC San Diego. Learn about spiritual organizations, programs, and services on campus, participate in religious/ spiritual dialogues in a supportive and inclusive environment, and connect with other students at regular events. Offers a variety of supportive and educational services, and ways to learn about different cultures and peoples through art, programs, workshops, and outreach. The CCC hosts an art space, lending library, and a community space for relaxing, studying, meeting with friends, cooking, and much more. The ITRC supports Native American and indigenous students and promotes educational access in our tribal communities. Join the email list for news and events, and visit the center on the 2nd floor of Price Center West (near SPACES) to learn about academic and other support services, mentoring / leadership development, and community activities. Provides a space for lesbian, gay, bisexual, transgender students, as well as staff, faculty, and our allies, to connect and come together in community. Let the LGBT Resource Center be your home away from home; visit the center and subscribing to the Rainbow Newsletter for up-to-date information on queer life at UC San Diego. This office schedules and co-sponsors support groups and other events, and also works with students and dependents with disabilities who register with the department for eligibility of modifications, adjustments, and other accommodations due to disabilities. The Raza Resource Centro is the newest Campus Community Center at UC San Diego. The RRC is open to everyone but we strive to emphasize and offer the access, retention and graduation of Chicano/as - Latino/as students as well as to create strong connections with the surrounding community. Student Promoted Access Center for Education and Service (SPACES) offers free programs that are student-initiated and student-run. By building and engaging community through programs, prospective and current students are empowered to be proactive in their educations and in their lives. Campus services for undocumented students are designed to provide caring, holistic, and individualized support. The Undocumented Student Services Coordinator offers private consultations, workshops and outreach activities, help for parents and families, information for faculty and staff, and a campus resource center that will give students a safe space to gather, study, and socialize. The center provides education and support to all members of UC San Diego regarding gender issues, with the goal of promoting an inclusive and equitable campus community. Regular events include a mother's group and monthly book club meetings. 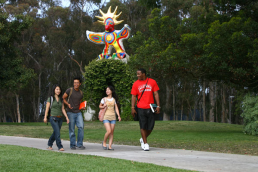 Connects you to other students and resources to help you thrive at UC San Diego. Find peers and mentors, community gathering spots, opportunities for involvement, and more. An all-inclusive organization that welcomes all students, both international and local. The club's programs, events, and activities are focused around increasing cultural exchange within a relaxed and inviting setting. Have lunch each Friday at the International Cafe, or join in any number of other events for international students and their friends — or anyone who shares an interest in international friendship and understanding. Find majors, minors, and programs for credit that focus on diversity issues. Link to financial support resources specific to underrepresented groups. Find research opportunities that help advance the goals and careers of underrepresented populations.